While Casablanca Bridal was established in 1997, the Amaré Couture collection was added for Spring 2007. 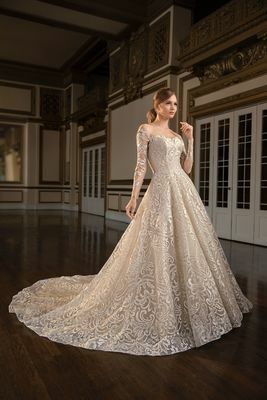 Amaré designs incorporate high quality silks, unique laces sourced from around the world as well as dazzling embellishments. Traditional and petite fit both run 2-28, with petite gowns measuring 1” shorter through the bodice. All gowns are made to measure, so the highest level of individualised sizing is guaranteed. Brides are recommended to start their Amaré Couture customisation shopping experience 6-8 months before their wear date, but rush order dresses are available for an additional cost. Amaré Couture are exhibiting at London Bridal Fashion Week, 24th-26th of March 2019, Stand B25.